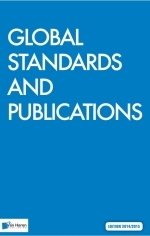 In the 2014/15 edition of Global Standards and Publications (free downloadable PDF, or hard copy) Van Haren Publishers combines an overview of popular IT standards and relevant publications. I won the paper booklet at the Best Practices User Group (BPUG) Netherlands 2015 Seminar tombola. In alpabetical order you’ll get an introduction to the standards in IT & IT management (e.g. Agile, COBIT, ITIL, Lean IT and e-CF), Project Management (e.g. MSP, PMBOK Guide, PRINCE2, MoP, M_o_R, and P3M3), Enterprise Architecture (Archimate and TOGAF), plus Business Management (e.g. Balanced Scorecard, BiSL, Six Sigma, and ISO 9000/9001. For each standard you’ll get the basics, a summary, the target audience, scope and constraints and a relevant website. Separated from this content, a second part highlights the Van Haren publications for these standards. A clever way to enable quick updates. PMI Netherlands Summit 2016: Disrupt!